The eight teams left in the FIBA Europe Global Vision U18 European Championship Women Division B are known after England defeated Estonia in this day's big game in Group C.
England and Finland join Greece, Romania, Croatia, Denmark, Belarus and the Netherlands in the qualification round. The only match of interest in the four-match programme for day 5 was the game between England and Estonia. Estonia needed to win to have a chance of qualifying for the next phase. Both teams went to work immediately from the tip-off with England having the better start. Femi Hamilton managed to draw a foul and split a pair of free-throws. This action was quickly followed by a trey from Gemma Bullard (right). However Estonia were soon on the scoreboard and the teams traded baskets for the rest of the quarter. England took fewer shots but turned the ball over more often as they edged the first quarter (22-17) with a Renee Busch buzzer beater. The second quarter was a ding-dong affair with the big ladies fighting for every loose ball in the paint. Maaja Bratka was doing most of the offensive work for Estonia and was helped in the rebounding battle by Annika Köster. For England Temitope Fagbenle mastered the defensive boards while Bullard (17 points) and Busch (11 points) kept the scoreboard ticking with England going into the locker room leading (41-31). The second half of the match was a typical FIBA youth international scramble with neither side really controlling the game. Both coaches had a hard time in getting their instructions understood and spent most of the time growling at their players. All the same the game was hard and fair with the ball flying in from all over the court. England's success from behind the arc and solid free-throw shooting enabled them to hold on to the lead going into the final quarter (57-53). Estonia needed to beat England by a single point to stay in the competition. Hence in the final quarter they went all out to make up the deficit. Maaja Bratka was in the thick of the action while her twin sister Maia Bratka was helping out. Estonia reduced the deficit on several occasions to 3 points. But on each occasion either Ballard or Busch scored for England. England gave the impression that they were in control of the game with five minutes to play leading (68-61). 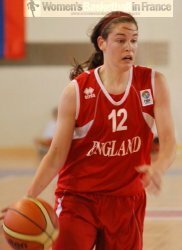 But it was not until Rheanne Bailey hit a pair of free-throws (72-64) that the England coach started to relax. Maaja Bratka, (25 points and 11 rebounds) playing to the limit, picked up her 5th foul with the game in money-time. Estonia's chances of turning the game without her disappeared leaving the way for Fagbenle and Ballard to score a few more points as England held on to win (75-68). Bullard finished the game with 23 points while Busch and Fagbenle contributed 22 and 17 points each. So the match ended in tears of joy for England and tears of dispair for Estonia.